Buick has unveiled the new 2014 Regal at the New York International Auto Show with updated styling and more premium technology. The full update includes a new exterior, interior, and a drivetrain design with a surprise. Buick has revealed the all-new 2014 Regal with many improvements for the flagship of the fast-growing luxury arm of General Motors. Updates are to be had inside and out, including a new infotainment system, improved active safety features, and an updated, sportier look. The Regal has always occupied a somewhat odd niche in the market, appealing to an upscale, older crowd and a refinement-seeking younger audience who also like performance with their luxury. The Regal and Regal Turbo fulfill the wants of a large market segment. Buick says that almost half of their buyers are those who migrate from other brands (called "conquests" in the automotive sales business). With the brand working hard to revise itself in North America while at the same time keep its position as the top-selling brand in China, GM's luxury branch has been working double time. 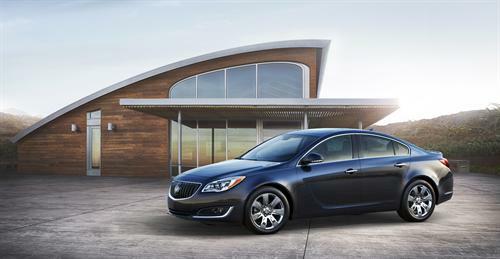 The new 2014 Buick Regal has received powerful new styling cues while still remaining true to its history. The sedan now has a more pointed and toothier front end and grille with a slight hint of a ridgeline up the center of its hood to emphasize that. The fenders remain low and simple, but larger, stronger headlamps emboldened by LEDs and matching, hawk-eye fog lamps give an impression of speed and power. The rake of the windscreen and more rounded roof line de-emphasize the thick center pillars while a wedge through the front door and along the running boards creates a more refined look. At the rear, a pronounced but not overbearing spoiler ridge juts up from a deck lid whose shape accommodates tail lights that match the rakishness of the lights in front. Chrome accents and simple, but imperial wheels finish off the details. All of those exterior upgrades are meant to add a more premium presence to the car and result in an expanded interior as well. Slightly more shoulder room is offered in this mid-sized premium sedan with all of the focus on the upgraded and expanded trim combinations that seem to funnel focus towards the infotainment and driver-assist features. Radar- and camera-based safety features like Rear Cross Traffic Alert, Lane Change Alert, Side Blind Zone Alert, Lane Departure Warning, Forward Collision Alert, and Collision Mitigation Braking give all-around assistance to passenger safety. These are behind-the-scenes features, however, compared to the new next-generation IntelliLink system Buick is featuring. This infotainment option not only updates with more intuitive controls, but now has natural speech recognition to allow the driver or passengers to give voice commands in everyday language for things like hands-free calling, radio tuning, smart phone music streaming, and more. To go with all of this interior refinement, Buick has also upgraded the powertrain to include all-wheel-drive (AWD), a big first for the Regal. The 2014 Regal incorporates AWD with an electronic limited-slip differential to optimize traction in all driving conditions. This will also lend the car a much sportier feel in handling and drive. Those who opt for the Regal Turbo will definitely notice this improvement along with the 18 percent more power the new 2.0-liter turbo engine offers. Those who go with the Regal GS option will also feel the improved cornering that AWD has to offer thanks to the GS mode on the Interactive Drive Control System. More boosted power comes thanks to the move to an electric-assist power steering, which removes the weight of the power steering pump from the engine. The Regal can also be improved in its base engine with an optional eAssist light electrification addition that will improve the fuel economy of the 2.4-liter base engine. All of these engine options are coupled to an efficient six-speed automatic transmission with the Regal GS offering an optional six-speed manual. The new 2014 Buick Regal is on display at the New York International Auto Show and will go on sale this fall.